A string of elaborate murders leads Inspector Trout (Peter Jeffrey) to believe that Dr. Anton Phibes (Vincent Price), an expert in music and theology, didn’t die in a car accident after all. More and more people fall to Phibes wave of death, as he dispatches a group of doctors and nurses, whom he blames for the death of his wife. The murders take the form of the ten biblical plagues of Egypt. Trout and one of the doctors on Phibes' kill list, race to stop him before he completes his sinister plan. 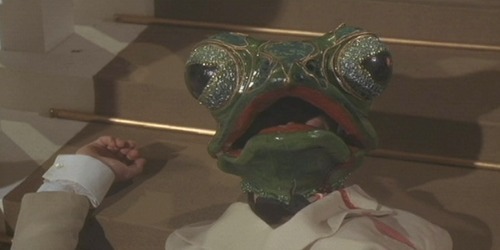 I was simply not expecting The Abominable Dr. Phibes to be as gleefully dark and strange as it was. In my head, I had conflated it with another Vincent Price movie, Theater of Blood (1973) which also features him dispatching people in various amusingly themed ways. This particular film is a lush black comedy with a heavy dose of surrealism; it feels like it might co-exist in the same universe as Phantom of the Paradise (1974). "Go ahead and gong me... I dare you." It is a brave choice to hire Vincent Price and then to deny the audience one of his most notable attributes: his voice. Dr. Phibes can only speak when attached to an amplifier via an audio jack in his neck (something Phantom of the Paradise also riffs on). The good doctor speaks little, and when he does it is with a distorted echo. This does give an opportunity to see what a fantastic physical actor Price can be. Dr. Phibes can throw out giant grandiose gestures and then can turn to the crumpled shuffling of someone beat down from suffering. Price embodies the character fully, and transforms Phibes into a monster you can really root for. One of the most startling elements of the film is its music. Like its central character, the score is grandiose, humorous, and occasionally sad. The story will take the occasional break to allow Phibes’ own mechanical band to perform a musical number. 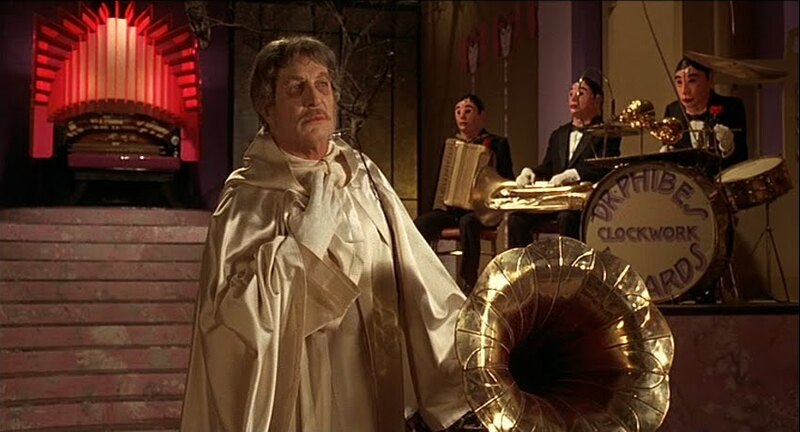 Since Phibes was a expert in music, it stands to reason that it would be prominent in the film. Director Furest takes risks and as a result, gives the whole production yet another interesting facet that elevates it from being just another bombastic horror movie score. This is a horror movie, so what about the horror? Dr. Phibes bases his plan for revenge on the ten plagues of Egypt, but the execution is never simple. It involves such things as brass unicorns, and boiled Brussels sprouts. Phibes also seems to like his death traps; one featured in the finale, would not be out of place in the Saw films. I really would not be surprised if those movies drew upon The Abominable Dr. Phibes for inspiration. The build-up to a horror scene is often rife with dark humor, but it turns gruesome and serious in mere moments. The story does an excellent job in varying up its tone in order to keep the audience off balance. Colorful, funny, and occasionally grim, The Abominable Dr. Phibes is expertly crafted and performed. An outstanding horror film, and worthy of cult status.